Because ‘Menus’ are the primary way users navigate a site it is important they are thoughtfully organized and put together. WordPress provides a simple ‘Menu Editor’ for creating, organizing and managing menus. 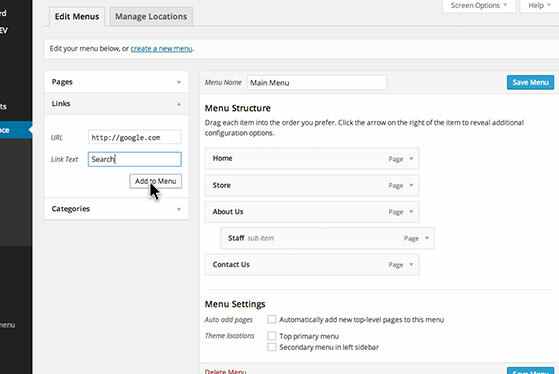 To create and manage menus click on ‘Menus’ under the ‘Appearance’ tab in the WordPress dashboard. Give your new menu a name where it says ‘Menu Name’ and click the ‘Create Menu’ button. Give your new menu a name where it says ‘Menu Name’ and click the ‘Create Menu’ button. Add a page to the menu by selecting pages from your site under pages, and click the ‘Add to Menu’ button. You can add custom links by clicking on the ‘Links’ button and entering a web address you would like the menu item to point to in the URL box and giving the button a title in the ‘Link Text’ box and click the ‘Add to Menu’ option. The ‘Categories’ option allows you to select post category archive pages to link to. Add custom links by clicking on the ‘Links’ button and entering a web address you would like the menu item to point to. Click, hold and drag a menu item under ‘Menu Structure’ to reorder menu items. To create a submenu, drag the item you want to display as a menu item bellow the main menu option and to the right and drop it in place. You can choose to automatically add any new pages you create to your menu by selecting the ‘Auto add pages’ option under ‘Menu Settings’. Assign where the menu should appear on your site by selecting options next to ‘Theme locations’ or navigating to the ‘Manage Locations’ tab and specifying what menus you would like to display.